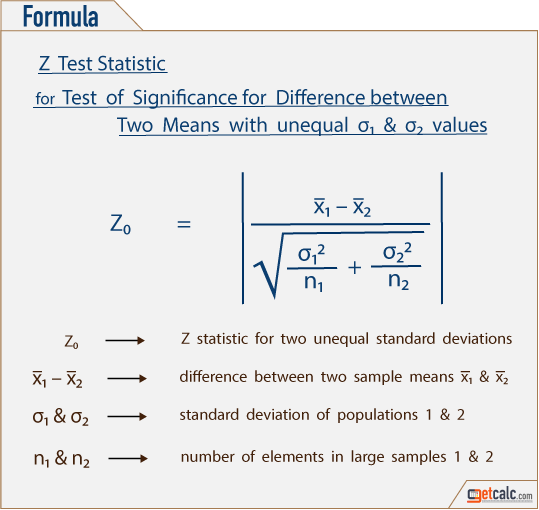 getcalc.com's Z-test calculator to estimate Z-statistic (Z0), critical value (Ze) from normal distribution table for given degrees of freedom (ν) & hypothesis test (H0) to conduct the test of significance for mean, difference between two means, proportion & difference between two proportions for large sample mean, proportion or difference between two means or proportions in statistical surveys & experiments. In addition, users can generate the complete work with steps for any corresponding input values to solve grade school Z-test worksheet problems. Users also use the population standard deviation & sample mean calculators seperately to calculate the corresponding values. 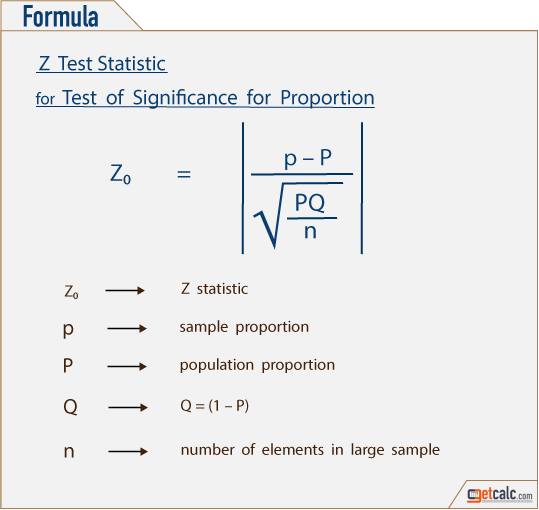 Z-test is the statistical technique which represents how many standard deviation or standard error the sample mean or proportion (p value) is away from the population mean or success proportions (p value) to check if the test of hypothesis (significance) is accepted in statistical experiments. 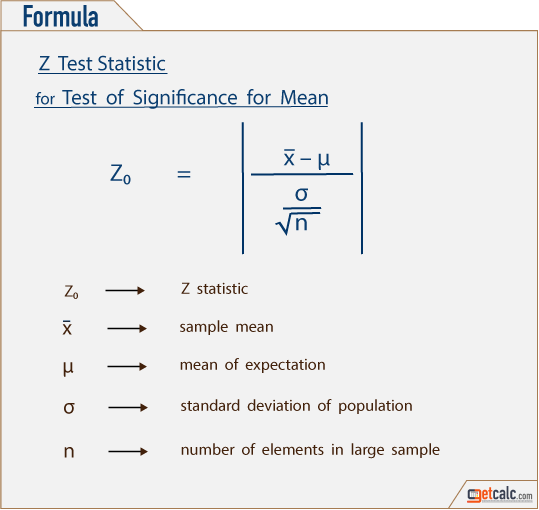 The Z-statistic (Z0) value used to test the validity of assumptions in the test of significance. Here the difference between the hypothesized & actual value of the sample data is being analyzed to determine if the difference is significant or not. Z-statistic is applicable for the test of significance for proportion, difference between two proportions, mean or difference between two means. The probability is higher for the hypothesized value for mean or proportion to be correct, if the difference between the hypothesized & actual value is smaller. The probability is smaller for the hypothesized value for mean or proportion to be correct, if the difference between the hypothesized & actual value is higher. The sample values should be large enough or approximately equal to the population parameters and all the sampling distributions follow normal asymptotically to conduct the test of significance for large samples using z-test. 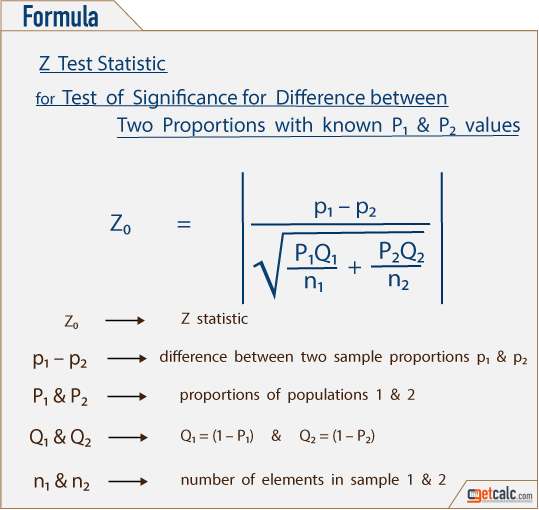 In the theory of statistics & probability, the below formulas are used in Z-test to estimate Z-statistic (Z0), critical value (Ze) & null hypothesis test (H0) to conduct the test of significance for mean, difference between two means, proportion & difference between two proportions. Users may use this Z-test calculator to verify the results of these below formulas, if the corresponding values are applied or generate the complete work with step by step calculation for any corresponding input values. 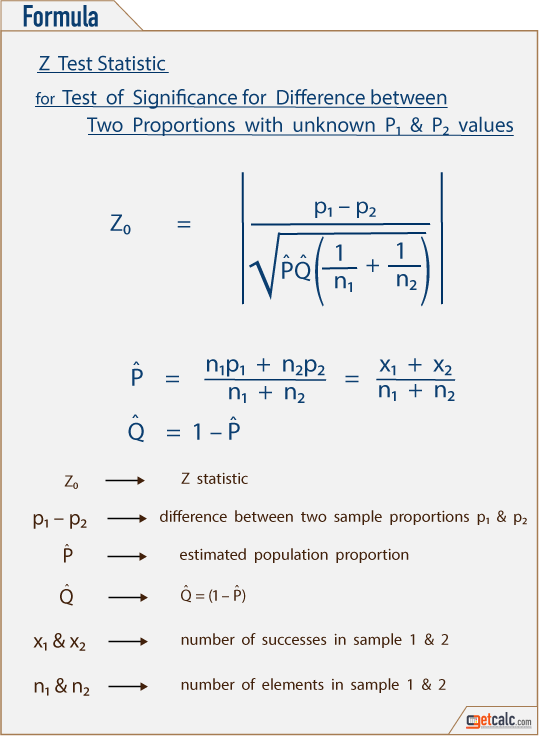 This Z-test calculator for test of significance featured to generate the complete work with steps for any corresponding input values for test of significance for mean (using standard deviation), test of significance for difference between two means (using standard deviation), test of significance for proportion (using p value) and test of significance for difference between two proportions (using p value) to solve the grade school Z-statistic workout problems. Supply the input values, click on "CALCULATE" button and then "Generate Workout" to generate the complete work with steps for the input given to this calculator. The below is the solved examples for Z-statistic calculation by using standard deviation & without using standard deviation.